This Worm Talk, presented by Kevin Smith from The Worm Shed, features a presentation covering gardening with worms, and the roles worms play in recycling and waste management. Worm Farms, Worms, Castings & WormWiz will be available for purchase/order, on the day. Kids, join us at Riverton Library for a presentation on recycling and gardening with worms. Get your hands into some worms, then make your own mini Worm Farm to take home! This Worm workshop, presented by Kevin Smith from The Worm Shed, features a presentation covering all aspects of worms, worm farming and the roles worms play in recycling and waste management. This is followed by an informal question time and a practical demonstration in setting up, operating and maintaining a worm farm. Worm Farms, Worms, Castings & WormWiz will be available for purchase at the workshop. City of Canning residents can purchase a fully established Worm Farm package at a discounted price. Enquiries to: sustainability@canning.wa.gov.au or contact Sustainability Officer, Clare Barnes on 08 9231 0570. All welcome, but bookings are essential! Worm Farms, Worms, Castings & WormWiz will be available to preorder, with collection at the event - discount available. Contact Lisa Porter for price list, preorders, and to book your seat: Ph (08) 9399 2312. Worm Farms, Worms, Castings & WormWiz will be available for purchase at the workshop. City of Cockburn residents can purchase either Worms or a fully established Worm Farm package (including worms) at a discounted price. Visit us at The Worm Shed stall at Gidgegannup Small Farm Field Day 2019. "A day for every one to learn and enjoy. Animals, fruit, vegetable, gardens, crops, fencing. Make jam, dry fruit, breed chooks, shear sheep, milk a cow or a goat. Taste fresh cheese, olive oil, wine, fudge. What can you do on your plot of land?" Kids make a free Worm Pack to take home! 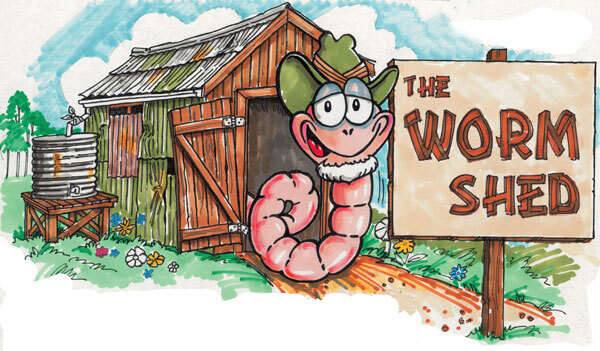 This Worm workshop, presented by Kevin Smith from The Worm Shed, features a presentation covering all aspects of worms, worm farming and the roles worms play in recycling and waste management. This is followed by an informal question time and a practical demonstration in setting up, operating and maintaining a worm farm. Worm Farms, Worms, Castings & WormWiz will be available for purchase at the workshop. This workshop, presented by Kevin Smith from The Worm Shed, features a presentation covering all aspects of worms, worm farming and the roles worms play in recycling and waste management. This is followed by an informal question time and a practical demonstration in setting up, operating and maintaining a worm farm. City of Melville residents can purchase either Worms, or a fully established Worm Farm package (including worms), at a discounted price. Worm Farms, Worms, Castings & WormWiz will be available for purchase at the workshop. Learn how to use a worm farm to transform household food scraps into useful products for your garden. This workshop presented by Kevin Smith from The Worm Shed, features a presentation on all aspects of worm farming and the role worms play in recycling and waste management. This is followed by a demonstration of setting up and maintaining a worm farm. Worm Farms, Worms, Castings & WormWiz will be available for purchase at the workshop. Residents and ratepayers of the City are entitled to a $100 subsidy on a worm farm (complete with worms and worm castings), or a $40 subsidy on 1kg of worms. This event is open to all members of the community. The Worm Talk, presented by Kevin Smith from The Worm Shed, features a presentation covering gardening with worms, and the roles worms play in recycling and waste management. Worm Farms, Worms, Castings & WormWiz will be available at the event.